The Admiral Villa is the most imposing villa of Phase I of Clos du Littoral. Boasting a unique layout with its wide open spaces, the villa combines elegance and luxury. The impressive master bedroom overlooks the entire first floor and a covered terrace. The modern kitchen opens on a spacious living and dining room, with panoramic windows showcasing the beautiful terrace. 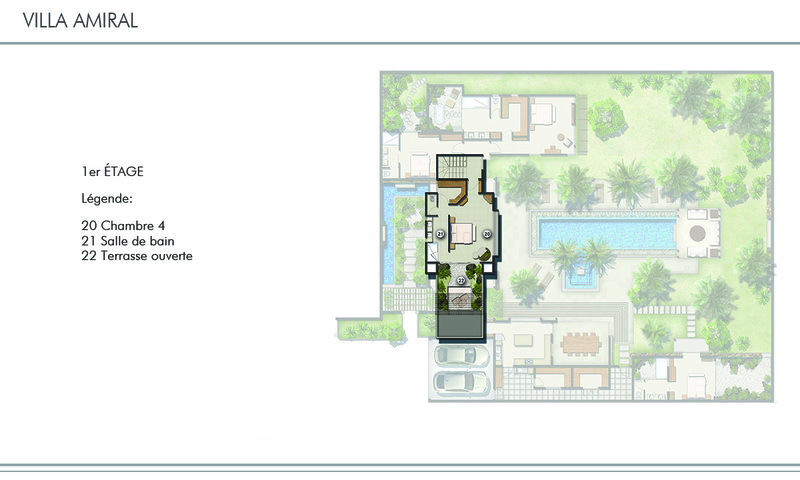 It also comprises two bedrooms with adjoining bathrooms, with an outdoor access to the main part of the house. An additional bedroom is located in the garden, separated from the rest of the house, providing complete privacy to its guests. The lush garden overlooks a central length pool of 65 m² and is complemented by a large gazebo furnished with outdoor seating. The Admiral Villa is truly the perfect artistic blend of comfort and refinement. The Amiral Villa is, with no doubt, the most beautiful and the largest villa offered by Clos du Littoral. Only 4 villas of this type can be found in the residence that is built on a total area of 1000 m². The Villa Amiral is at the same time a real architectural jewel, very well oriented, and offers spacious and bright living spaces. Perfectly functional for everyday use and soothing by its refined architecture, Amiral villa is built in the form of L, with a built area of 552 sqm. 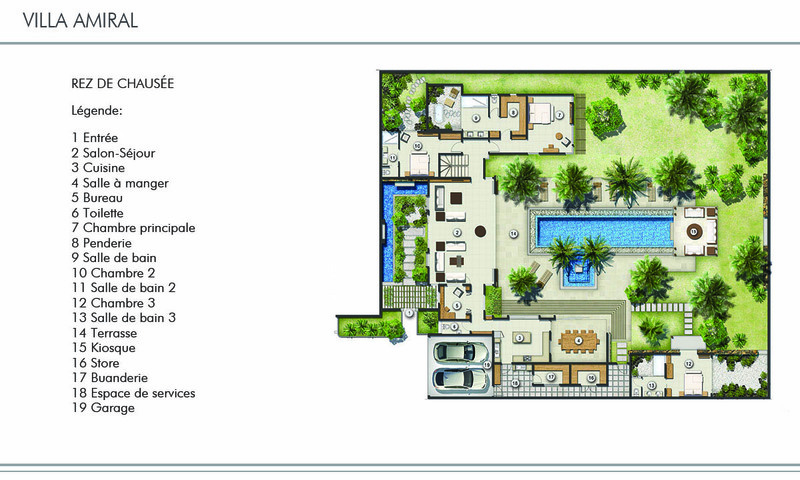 Amiral consists of a 4 bedrooms’ property; each equipped with their own bathroom. The major particularity of the Amiral Villa is the separation of two bedrooms from the rest of the villa. Indeed, one is located on the first floor of the property, and the other is positioned in the garden yet in front of the pool. Amiral villa is designed in a practical way both in his inner disposition as well as outside. The choice of large openings, overlooking on the garden from both the main entrances and the windows, gives the villas an open and communicative character between the indoor and outside. Throughout the year, the warm climate of the northern region is well take into account, yet providing shadow areas. The architectural principle of Amiral villas shares a modern and refined design. Their large openings create a natural light, thereby generating an atmosphere of serenity throughout the properties. There is a beautiful contrast between the neutral colours of the interior, the surrounding vegetation, and materials such as volcanic rock, coral or wood. The choice of furniture and interior design provides just enough colour and texture to this architecture without any excess or clutter. To complete this set, a botanical design was specially developed so as to enhance this wonderful villa. Small private garden adjoining the bathrooms have also been created using a mixture of stones, corals and plants. Its large pool of 66 m² is the heart of the garden with its straw kiosk-attached. 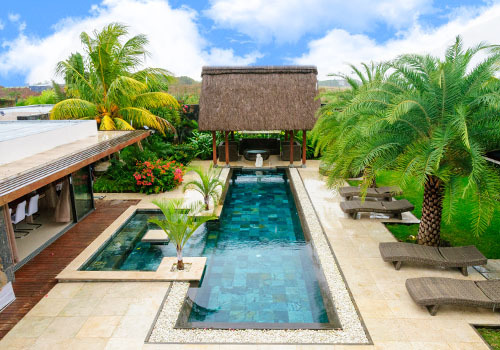 With a land area close to what is usually offered for irs, this type of villa is precisely designed for demanding clients looking for a high-end residence, but at a competitive price.